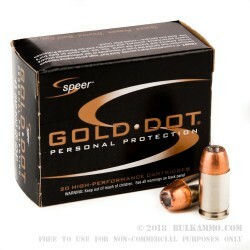 Speer’s venerable Gold Dot personal protection and duty ammunition in the .45 GAP for those who are committed to the round with its shortened length and comparable ballistics to the original .45 ACP. 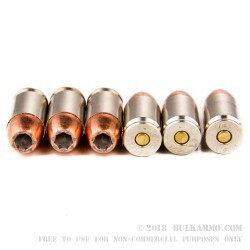 This is the penultimate bonded jacketed hollow point ammunition that also just so happens to be one of the oldest brand names on the market that has had little to no engineering changes since its unveiling. 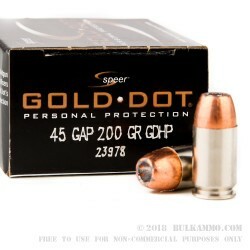 That speaks volumes about the capabilities of the Gold Dot projectile and about the designers and engineers that developed it in the first place. This is the flagship in the product portfolio, with the uniform expansion and deep penetration; reliability in function and in mushrooming. This round offers 970 feet per second velocity and 418 pound feet of energy out of the barrel. 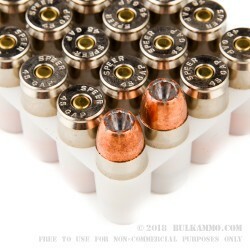 The performance numbers for the size of the cartridge means that this round represents the truest sense of what modern ammunition innovation has looked like for the past several years. The novelty of being able to shoot near .45 ACP ballistics out of a much shorter round makes the 45 GAP a game changer for those who haven’t been able to use the thick grips of the double stack .45’s in the past.